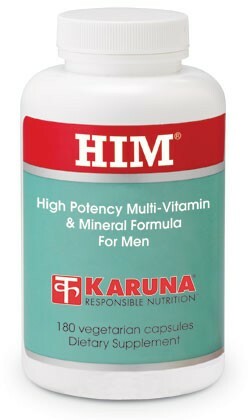 HIM is an iron-free multi formulated with a particular emphasis on men's ongoing wellness. In addition to comprehensive vitamin and mineral ingredients, HIM contains a broad antioxidant complex, including lycopene for cellular health. Beta-sitosterol supports healthy urinary flow, and standardized Panax ginseng supports physical endurance. Suggested use for adult men: Six capsules daily, taken with meals.